As a side-project I have been working on an OpenSim model of part of Edge Hill. The timepoint is c.1886-7 to coincide with the major national and international exhibitions held in a vast purpose-built hall just off Edge Lane. Although much has been written on the topic by Murray Steele and collaborators, I am still looking for visual content to inform the build. 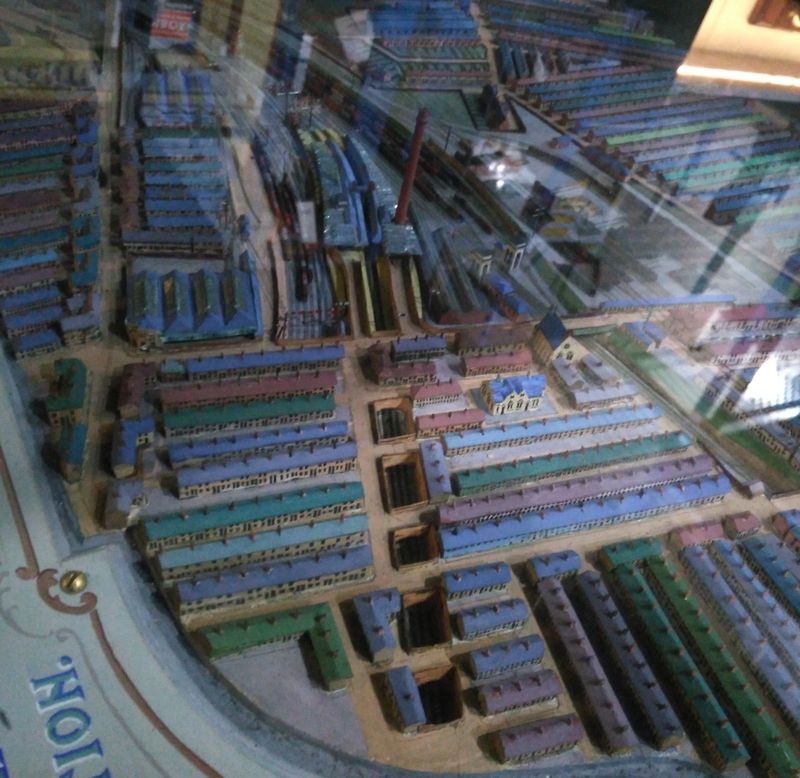 I was delighted therefore to find a superb 1/18000 scale model of the area in the Warehouse space at the National Railway Museum at York. It was created by the London & North Western Railway (L&NWR) specifically for the 1886 exhibition which was known locally as The Shipperies due to the large number of model ships on display. 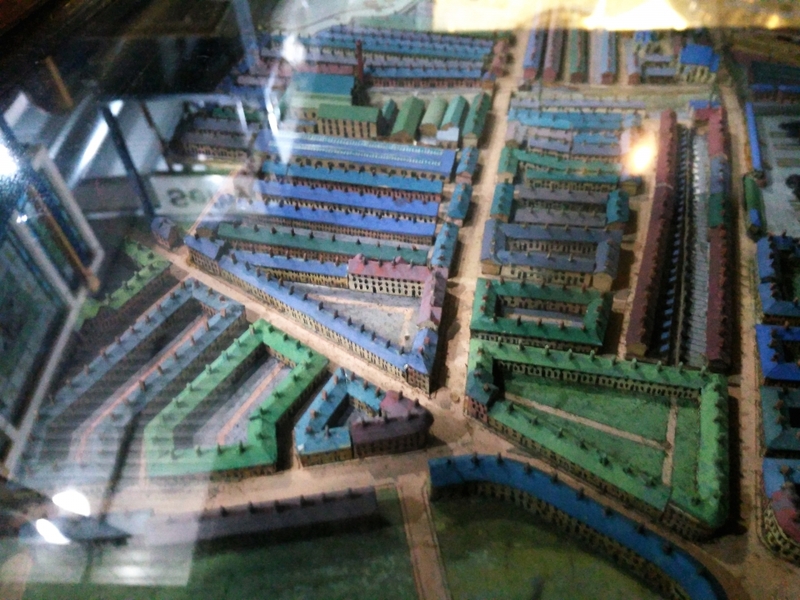 The L&NWR model shows the huge Edge Hill gridiron goods yards and surrounding areas, including the station, tunnel entrances, Wavertree Botanic Gardens and the building housing the Shipperies Exhibition of 1886. Indeed, the model was developed specifically for that exhibition and I like to imagine there's a miniature copy of it inside the Shipperies model and so on ad infinitum! Doubtless the same thought struck many of the visitors to the exhibition. Edge Hill station received its first trains in 1836 when the passenger terminus switched from Crown Street to Lime Street. Initially trains ran down to Lime Street under gravity and were rope-hauled up to Edge Hill by stationary engine. By 1886, however, passage in both directions was driven by locomotives with the tunnel partially exposed and a large ventillation tower on Smithdown Lane used to evacuate smoke (Ramsbottom's chimney). Both the Victoria/Waterloo and (more distant) Wapping tunnels continued to be rope-hauled. The gridirons opened in the early 1870s and by 1875 the establishment at Edge Hill covered some 40 acres. At the time of the exhibitions the gridirons were probably approaching the summit in terms of their size and level of activity. Their importance was sustained through the two world wars but then severely diminished by the advent of containerization in the 1970s. Further details are available in a blog by Jan Ford and in this thread. I have a fairly basic smartphone and had to crop and enhance a few of the images to make them adequately visible. 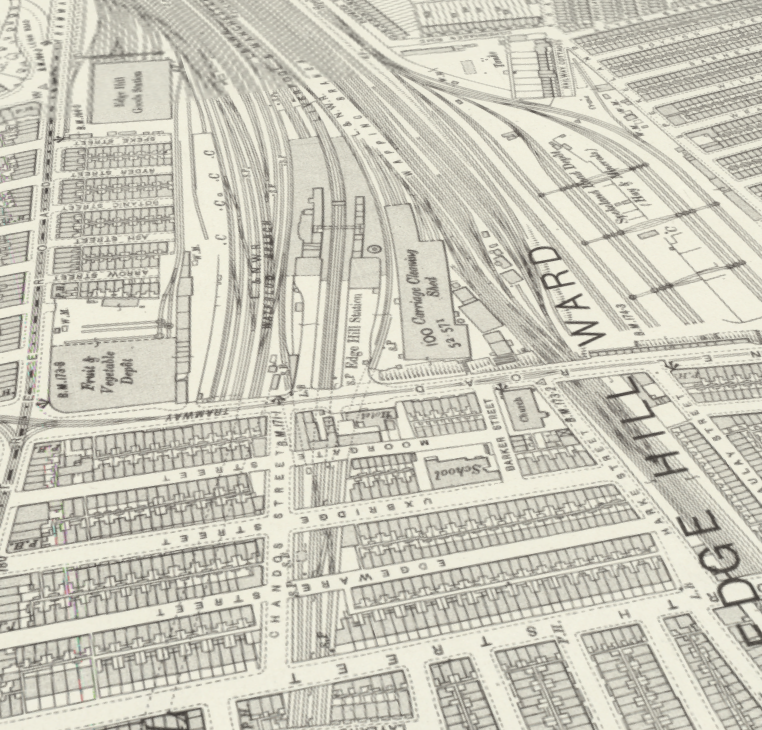 Where appropriate, I've added 3D map views from the 1905 25 inch Ordnance Survey courtesy of National Libraries Scotland. The map legends are linked to the appropriate view though not always at the same magnification. Of course, the model and map are separated by 20 years so there will be differences. 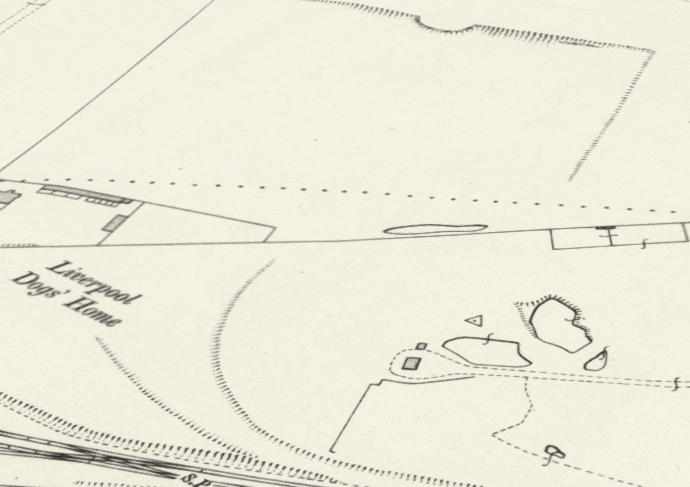 Nevertheless, many features carry over between the two, the main exception being the Shipperies site which the map shows as largely vacant space. Fig.1: The model is in a wooden case at a good height but partially obscured by the shelf above and reflections on the glass cover from an adjacent illuminated exhibit. Fig.2: The gravitational marshalling of trains at Edge Hill was the brainchild of Harry Footner whose signature can be seen on the title panel. Fig.3a: The extensively canopied Edge Hill station from the south-east with a substantial chimney on its south platform. Tracks leading to Crown Street and Wapping can be seen nearer the bottom, the Victoria/Waterloo tunnel at the top. Fig.4a: Looking back to the station along the line of the partially covered Lime Street tunnel with the Victoria/Waterloo tunnel to the left. The model extends into the far distance. Fig.5a: Looking up Chatsworth Street (centre) and Tunnel Road (right) from the south with Smithdown Lane crossing diagonally. The Windsor Barracks and Victory Machine Works are to the left off Chatsworth Street. A single "Pillar of Hercules" appears to be present on the north side of the cutting, one of the chimneys for the boilers driving the stationary engines in the (now demolished) Moorish Arch. Fig.5b: Corresponding NLS 3D map view. 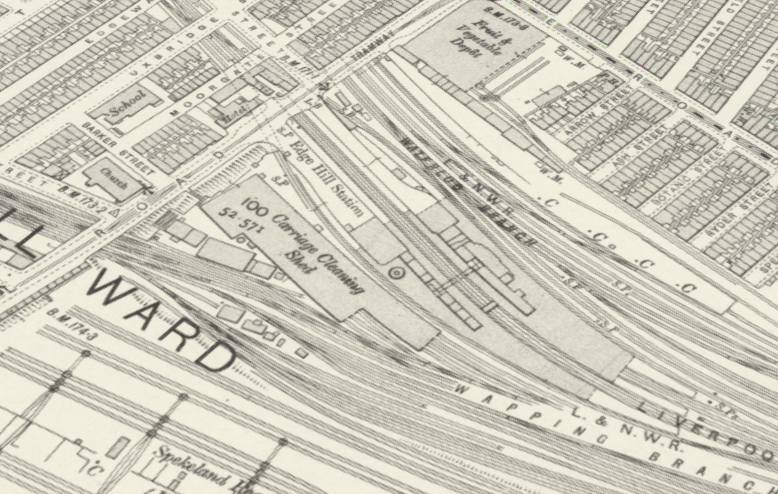 The Phoenix Safe Works aand Crown Street yard are just off the map to the left (west). 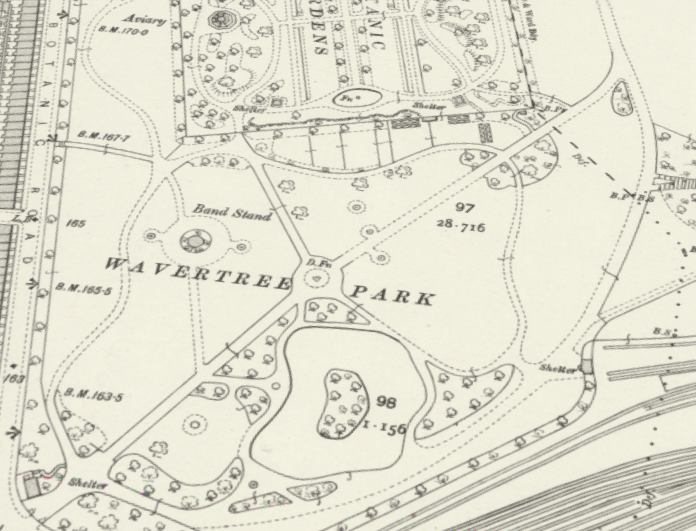 Fig.6a: Wavertree Park and, to its north, the walled Wavertree Botanic Gardens. 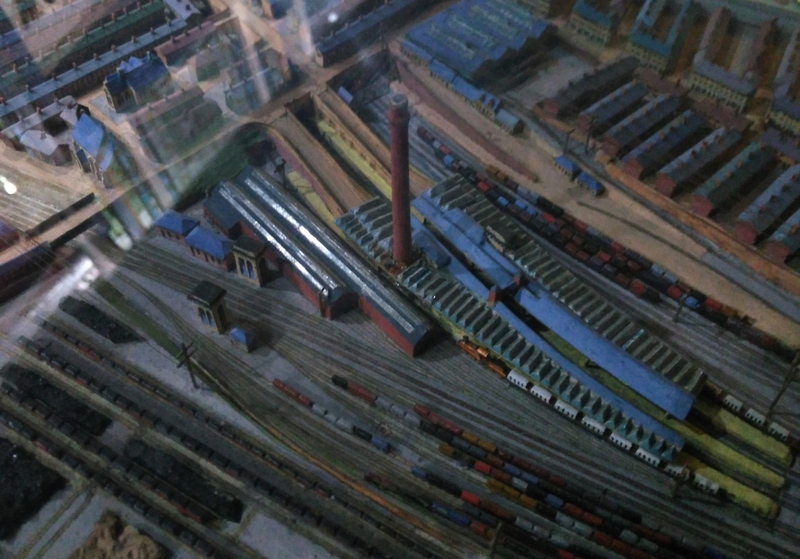 The sidings at bottom right were used by trains bringing excursionists to the Shipperies exhibition. Fig.7a: The Shipperies Exhibition was opened by Queen Victoria in 1886. The building was used for a less successful Jubilee exhibition the following year after which it was closed and demolished. Fig.7b: Corresponding NLS 3D map view. Ultimately the space would be occupied by the Corporation tram depot and the iconic Art Deco Littlewoods Pools building on Edge Lane. The model is on a much grander scale than the above images would suggest; probably only a third of the total area is shown here. The model does not, however, extend all the way to Edge Lane or, indeed, to Crown Street. I suspect it was produced to a tight timescale and in advance of actual completion of the Shipperies exhibition building as there are a few discrepancies. This is hardly surprising as the exhibition itself was drawn together in some haste. The model has no explanatory labels. Perhaps there was an accompanying leaflet or annotated poster conveying additional information regarding the gridirons. The inclined plate glass cover suggests that the model was to be viewed from one side only and may have been located against a wall. Although there are no labels, roofs appear to be colour-coded although again the code is obscure. Non-residential buildings (Shipperies, L&NWR properties, churches, schools) appear to be mainly bright blue. Elsewhere colours may have helped distinguish separate distinct terraces or blocks of housing. If there was an accompanying poster, this may have helped viewers correlate locations between model and poster. Although the modelling is fairly crude in some respects, it successfully conveys an immersive appreciation of the locale. Some of the larger buildings are shown in detail likely unavailable elsewhere. Little of the 1886 physical environment exists today. 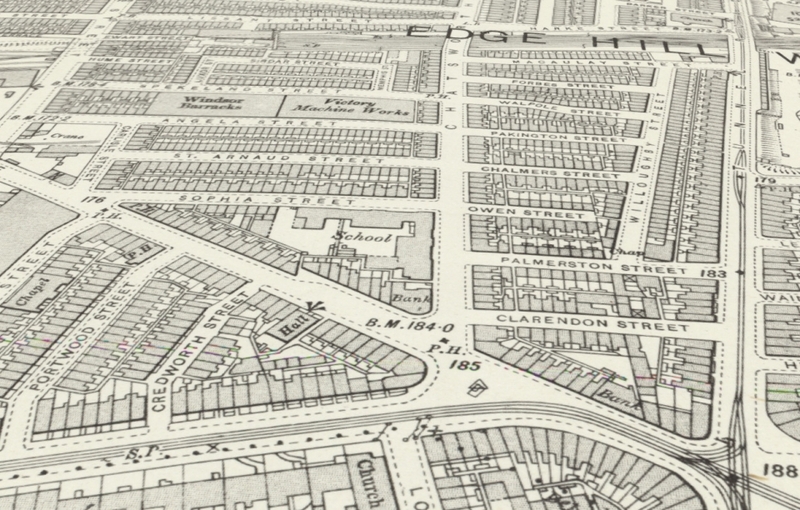 Exceptions include parts of Tunnel Road, the station (including tunnels and carriage ramps), Botanic Road and the adjacent park, the Picton Road bridge, and (possibly) part of Wavertree gas works. It seems as though the main entrance on Exhibition Road was originally intended to be surrounded by twin towers. 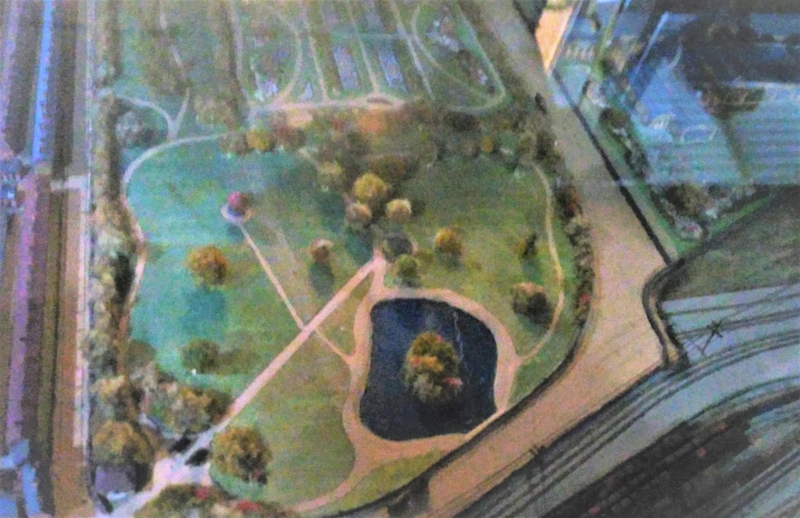 These appear in the model and in other promotional material but are noticeably absent from sketches of the opening procession and photos of the building prior to demolition. I strongly suspect that they were never completed due to time and cost constraints. Their inclusion here suggests that the modeller had an advance plan of the layout. 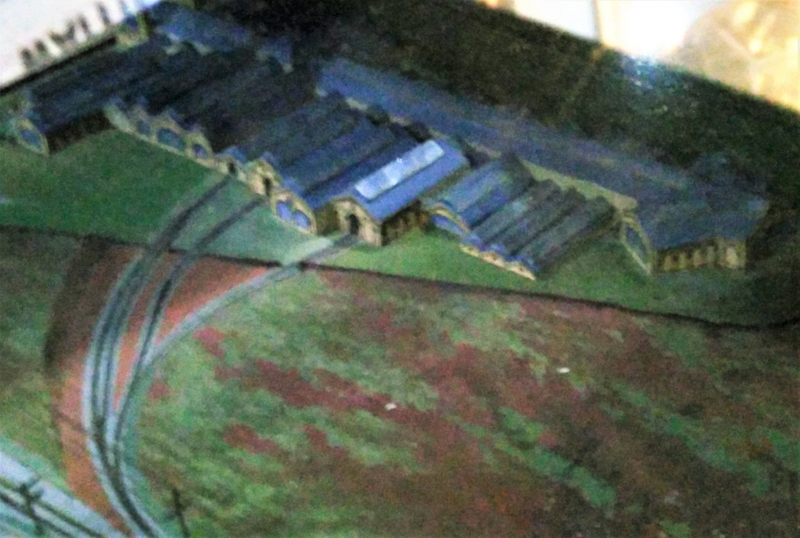 Similarly, we know that ultimately there were additional attractions located between the building and the railway which are not shown here. Nevertheless, it is an extremely impressive piece of work. The rail tracks leading up to the building enabled exhibitors to bring heavy objects into the building. Whether all three tracks were used for this purpose is moot as interior photos suggest that only the easternmost hall had a large doorway. This led to the heavy machinery exhibits, including locomotives. The L&NWR also had some booths outside and there were demonstrations of engines in steam on the adjacent tracks. These were not, however, used by excursion trains as separate sidings were provided. Somewhat surprisingly these are devoid of temporary platforms in the model. 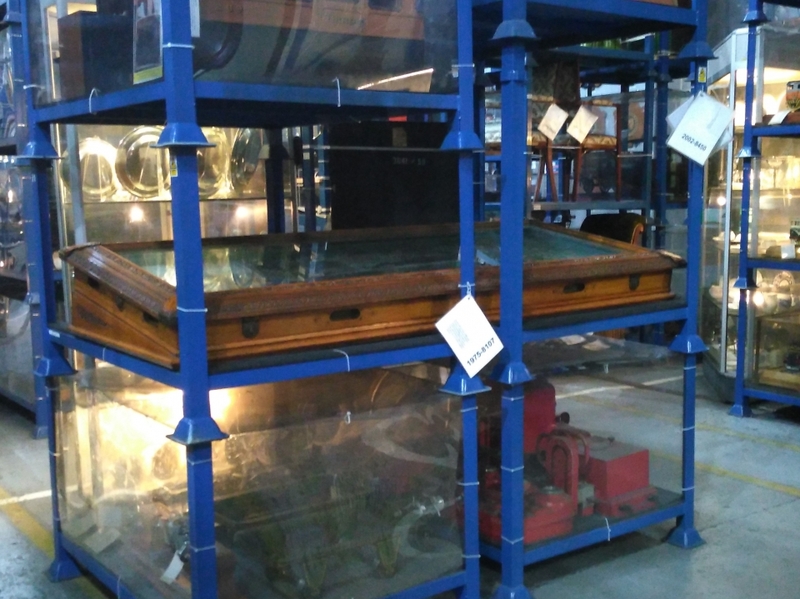 When I visited in September, the model's wooden case was far from accessible (I had the sore head afterwards to prove it!) and there was negligible interpretation for what is a significant historical "document" when seen in a local context. 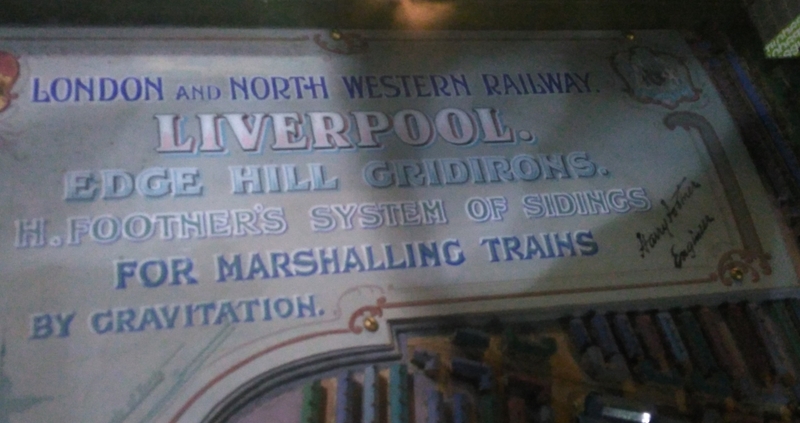 To be fully appreciated the model really needs to be somewhere on Merseyside, either at the Museum of Liverpool or, better still, part of a display at Edge Hill station as a physical complement to Metal's Edge Hill archive. Perhaps an extended (or even temporary) loan could be made. Failing that, there needs to be a comprehensive repository of high quality images that could be used for future research and as the basis for a poster-style display at Edge Hill station.